Travelers, tourists and backpackers love a sense of adventure. When visiting an exotic city in a third-world country, there are plenty of adventures to be had, not only in the attractions to see and activities to do, but also in the foods and drinks to try. Eating and drinking in Sihanoukville is a fun experience as tourists get a taste of the Sihanoukville-style of hospitality within its inviting white-sand beaches. This beach-city has a lot to offer to those who wish to taste something different and exotic. Not only are the foods and drinks tasty, they are also cheap: a local meal starts from US$0.50, burgers cost US$1, expensive meal at US$3 and pizza also at US$3. Beer starts from US$0.25 to US$1. 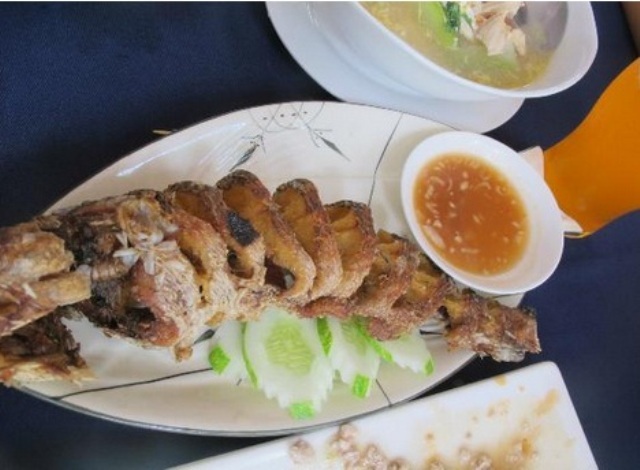 Below is a list of some of the major food places in Sihanoukville you might want to try out. From its name alone it is easy to tell that the Grand Restaurant Kampuchea is a major food place in this tiny tourist city. Located near the Golden Lions Monument, Grand Restaurant Kampuchea serves authentic Khmer food and BBQ every night. The house specialty is the Chicken Amok Curry in coconut milk that is very affordable at US$3. If you enjoy BBQ, go to Angelo’s Restaurant near Golden Sands Hotel and ask for their ribs BBQ. It’s simply to die for. For a taste of the international, here are your choices: Japanese food at Happa or Ku Kai both found on Serendipity Beach; for French or Italian, go to La Reserve Sihanoukville on Victory Hill, L’luna d’Autunno on Ekareach Street, or La Paillote on Victory Beach, which is considered one of the top restaurants not only in Sihanoukville but also in all of Cambodia; for spicy Mexican foods – fajitas, tacos, quesadillas and so on – visit The Mexican on Serendipity Beach Road; Thai food at Same Same But Different (yes, that’s the name of the restaurant) on Serendipity Beach; and finally go to Maharajah for a taste of exotic Indian halal dishes. If you wish to just sit back and relax while sipping a warm cup of coffee, go to Cinderella’s Coffee Shop on Serendipity Beach Road or Sunshine Café on Otres Beach. Sunshine Café is popular for maintaining a nice community atmosphere as the place is run by a friendly Polish and Khmer couple. Five other interesting restaurants are The Look Bar and Restaurant on Victory Hill (famous for its many attractions that include a swimming pool, TV screens, Wi-Fi connection, BBQ and live music), Mick and Craig’s Restaurant near the Golden Lions Monument (famous for its drinks and nightly specials), Noh Kor Phnom on Ochheuteal Beach (well known as a no-frills seafood restaurant), Pim’s Restaurant also on Ochheuteal Beach (known for its mini-golf course, darts, pool table and table tennis), and Mama Clare’s Restaurant and Bar on Otres Beach (well known to be a very friendly place). In addition to these well established restaurants and cafes, there are tiny food stalls along the beaches, especially at Ochheuteal Beach (the most frequently visited beach), serving cheap but delicious local dishes such as grilled meat, chicken, and seafood and often with beer. There are just so many eateries to choose from if you wish to just go around and enjoy eating and drinking in Sihanoukville. Be ready to get a good fill.